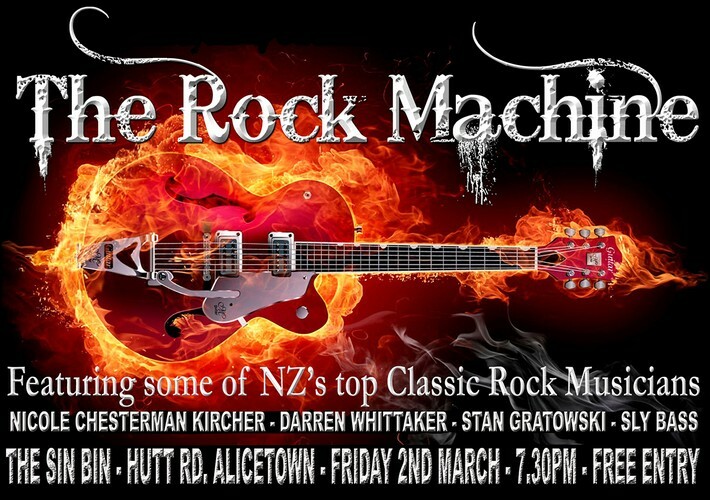 The Rock Machine Show rolls into the Sin Bin for the first time, with the most experienced rock musicians in NZ. Darren and Stan from The NZ Pink Floyd Experience, ex-Turbo Rats - Sly from Hitchcock Railway, NZ's Joe Cocker Tribute and Nicole Chesterman Kircher who rocks around in a few bands, ex-backing vocals for the PFE, lead singer with retro group The California Dreamers and many many more... even dabbling in one of the hottest Wgtn Jazz groups "High Society"! All these musos have tread the boards both here and overseas, but home is where the rock is and along with some great classics they bring a little blues, reggae, pop and disco so that the ladies get their fill too. Come and say hi - 7:30pm - 10:30 is not long but enough time to party and share the love!